Redefine the contours of your face with the Clarins Men Hydra-Sculpt Resculpting Perfector, a daily chiselling treatment for men looking to reduce the thickening of their jawline. 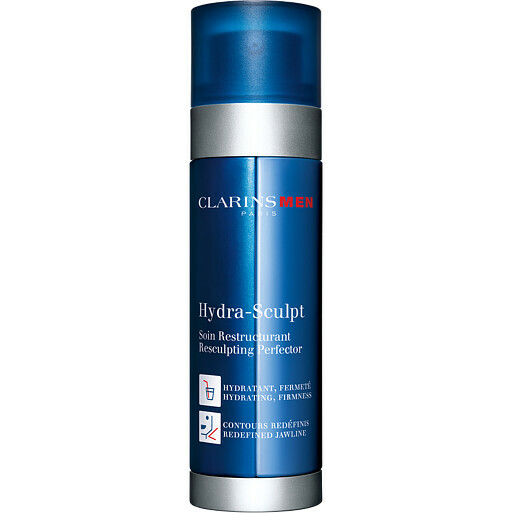 The Clarins Men Hydra-Sculpt Resculpting Perfector provides your skin with a dual action care. Perfect for slackening skin that has lost shape and definition, this innovative gel-cream formula hydrates, soothes and tones areas of concern. Enriched with the comfort of a cream and the freshness of a gel, the Hydra-Sculpt Resculpting Perfector has the perfect texture. Lemon extract encourages fat release in the skin, whilst slowing down the formation of new fat cells. Salicylic acid removes dead skin cells for a smooth result, and prevents in growing hairs. Oat sugars tighten and firm the skin, whilst the Clarins Men Energising Complex re-energises skin to diffuse all signs of fatigue. Use every morning and evening. Dispense 2 to 3 pumps into your hands and apply to areas of concern on the face.